Clematis vines are a wonderful addition to any garden. The large showy flowers of the hybrid varieties are a showstopper in the summer months. The montana, macropetela, heraclefolia paniculata and other species varieties have smaller flowers but extend the season from early spring with the montana varieties to late fall for the paniculata (Sweet Autumn). 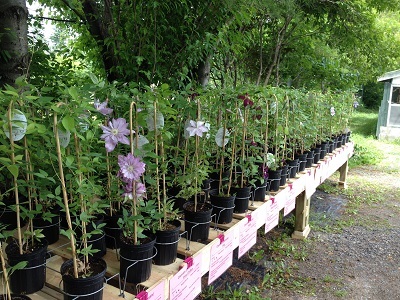 Clematis can use large shrubs as their trellis, and the flowers in summer peeking out from our Serviceberry, Lilac and Amur Maples always lead to questions about what kind of shrub that it with the huge flowers. Likewise Clematis will grow along with a climbing Rose. All varieties of Clematis benefit from being cut back in the spring for the first few seasons to strengthen the plant, but then pruning will depend on the variety. Varieties that bloom on old wood need to have a less drastic prune, while certain varieties need little or no pruning once established. Many of the double flowered varieties will only have double flowers on old wood. 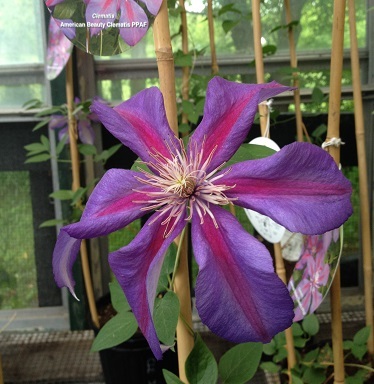 Make sure you know which pruning method your Clematis need.